I’m wanting to learn a bunch about the Apollo technologies, so I’m going through how everything worked. I’ve come across a photograph (the one attached) and I’m curious as to what that large umbrella-like object that’s casting that shadow is. I’m also curious as to its purpose and function. I’ve been going through many reports on what was taken to the moon on each mission, but I haven’t had much luck in finding it. Though, it does look to me like it would be used to help communications with Mission Control. Or something like that. Anyways, sorry for my ignorance. Here is a nice picture of the Apollo 14 S-Band antenna. It was also carried on Apollo 11 and 12 but it wasn't deployed on Apollo 11.
ka9q will be along shortly to discuss. BTW: Doesn't the white cable dangling off the ground just tempting somebody to trip over it make you wince? 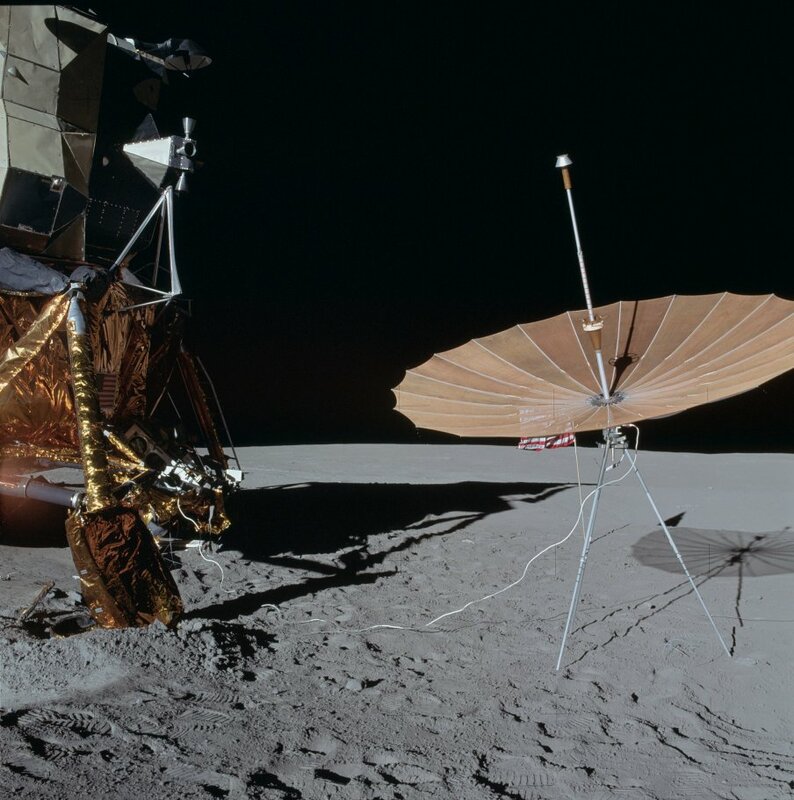 As far as I know John Young actually destroyed an ALSEP experiment because he tripped over a cable. The deployable S-band antenna did provide quite a bit more gain than the steerable S-band antenna on the LM, but it lost much of this advantage from the extra cable loss. The deployable S-band antenna wasn't needed on the J missions because the LCRU (Lunar Communications Relay Unit) carried on the rover had its own antennas. Note how much smaller the LRV dish antenna was than the deployable antenna on 12 and 14; that's how much difference the shorter cable made. The smaller antenna was also much easier to point. Thank you very much for the help. I do appreciate it a bunch. Yeah, he pulled the wires out of the connector, IIRC. Once back in the LM he tried to bare the cable ends so as to rejoin to the connector but it was futile. I have it on good authority that gaff tape will not stick to dirt. One would think Kubrick might have asked the grips to put a rug over it or something.